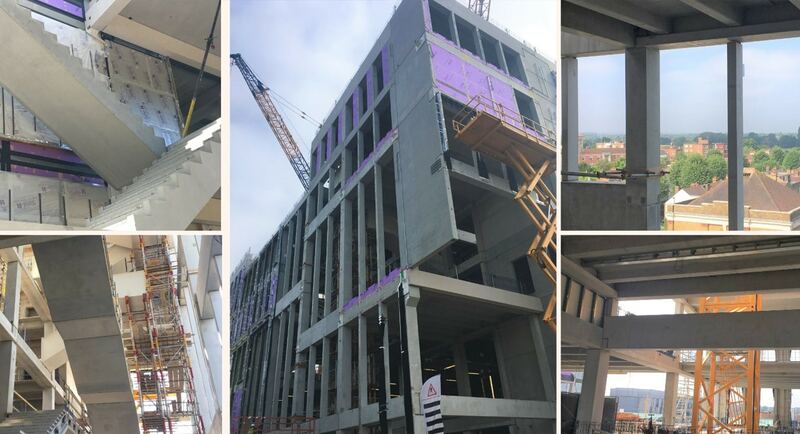 Kingston University London, Level 6 - Banagher Precast Concrete Ltd.
We’re up to the final level in Kingston University – this entirely precast structure has been assembled on site by a team of just 20. This building demonstrates how precast can accelerate a programme and offer instant finishes. All precast was manufactured in our head-quarters in Ireland – the consistency of aggregates, cement mixes & moulds were a client requirement to ensure that all the concrete was the same colour, this consistency is part of Grafton Architects vision for the building as the majority of the precast will be visible in the structure. Banagher Precast Concrete are proud to be working with PCE Ltd on this iconic structure providing 318 beams, 275 columns, 50 solid walls, heated precast stairs, bespoke slabs, raker beams, auditorium seating & architectural precast fins – it is a masterclass in offsite precast hybrid construction.